Beat eggs, milk, parsley, salt and pepper sauce until well blended; set aside. Heat oil in 10-inch nonstick skillet over medium-high heat. 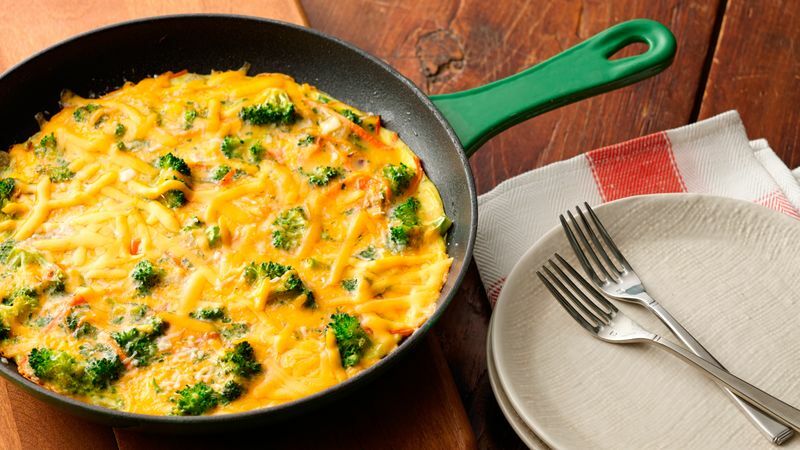 Cook broccoli, carrot and onion in oil about 5 minutes, stirring frequently, until vegetables are crisp-tender. Pour egg mixture over vegetables. Sprinkle with cheeses; reduce heat to low. Cover and cook about 10 minutes or until eggs are set in center. Cut into wedges. Beat the egg mixture thoroughly with a fork or wire whisk until it is uniformly yellow. Substitute 1 1/2 cups broccoli slaw for the broccoli flowerets and carrot.